The Wiley Classics Library consists of selected books that have become recognized classics in their respective fields. With these new unabridged and inexpensive editions, Wiley hopes to extend the life of these important works by making them available to future generations of mathematicians and scientists. This title addresses those basic aspects of research design which are common to many related fields in the social sciences, health sciences, education, and market research. The work presents a unified approach to a common core of problems of statistical design that exists in all these fields, along with basic similarities in practical solutions. Describing many examples and analogies that are 'portable' from application field to application field, Statistical Design for Research deals with designs that are the primary basis of research studies, but are neglected in most statistical textbooks that tend to concentrate on statistical analysis. 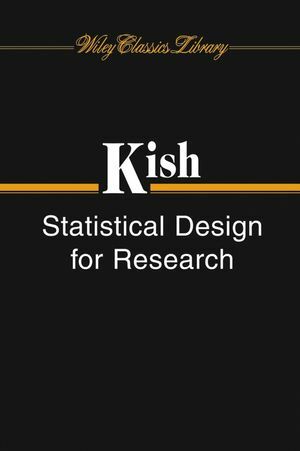 This text takes a broader, more general and philosophical view of the statistics for the more fundamental aspects of design than do the standard treatments of experimental design. Extensively illustrated and carefully organized into seven chapters and 44 sections, this book can be readily consulted by research workers or graduate students! Leslie Kish, PhD, was a Professor at the Institute for Social Reseach at the University of Michigan. He was President of the American Statistical Association in 1977 and was a Fellow of the Royal Statistical Society and the American Academy of Arts and Sciences. 1. Representation, Randomization, and Realism. 1.2 Four Classes of Variables. 1.3 Surveys, Experiments, and Controlled Investigations. 1.4 Randomization of Subjects Over Treatments and Over Populations. 1.6 An Ordered List of Research Designs. 1.7 Representation and Probability Sampling. 2. Analytical Use of Sample Surveys. 2.1 Populations of Elements and Sampling Units. 2.2 Inferences from Complex Samples. 2.3 Domains and Subclasses: Classifications. 2.4 Overview of Subclass Effects. 2.5 Proportionate Stratified Element Sampling (PRES). 2.7 Four Obstacles to Representation in Analytic Studies. 3.1 Substitutes for Probability Sampling. 3.2 Basic Modules for Comparisons. 3.3 Four Modules: Costs, Variances, Bias Sources. 3.4 Five Basic Designs for Comparisons. 3.5 Classification for 22 Sources of Bias. 3.6 Time Curves of Responses. 4. Controls for Disturbing Variables. 4.2 Analysis in Separate Subclasses. 4.5 Standardization: Adjustment by Weighting Indexes. 4.6 Covariances and Residuals from Linear Regressions; Categorical Data Analyses. 5.2 Samples Compared to Censuses. 5.3 Samples Attached to Censuses. 6. Sample Designs Over Time. 6.2 Purposes and Designs for Periodic Samples. 6.3 Changing and Mobile Populations. 6.6 Cumulating Cases and Combining Statistics from Samples. 7. Several Distinct Problems of Design. 7.1 Analytical Statistics from Complex Samples. 7.2 Generalizations Beyond the Modules of 3.3. 7.4 Weighted Means: Selection, Bias, Variance. 7.5 Observational Units of Variable Sizes. 7.6 On Falsifiability in Statistical Design.